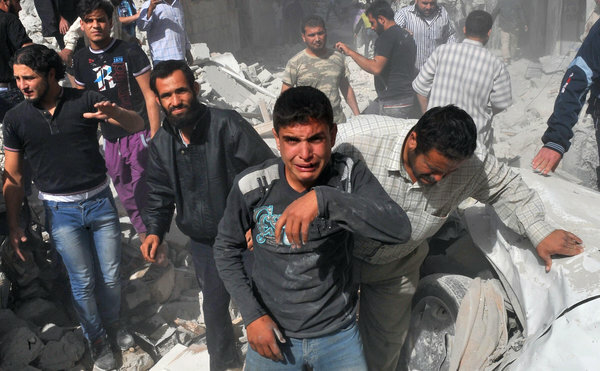 “Aleppo is under siege. Transporting heating oil for people to survive the winter has become a dangerous task. The price of mazout, the cheap fuel that heats most Aleppo homes, is now double what it is in Damascus, when people can find it. In Aleppo’s center, where the Syrian army maintains control with fortified positions, roadblocks, and regular patrols, the only commodity that seems to arrive without hindrance is food. Plentiful produce from local farms is on display on the open sidewalks that have replaced the burned-out fruit and vegetable stalls in the old souks. See from FAIR: “This Time, Trust Anonymous WMD Claims — They’ve Got ‘Specific Intelligence’” about recent media and government claims about the Syrian government preparing to use chemical weapons.